If you haven't been to beautiful and historic Shelsley Walsh yet... Why not!? It's a great place to watch motorsport, and see some amazing cars (just look at the photo below). And now you know when to go too! 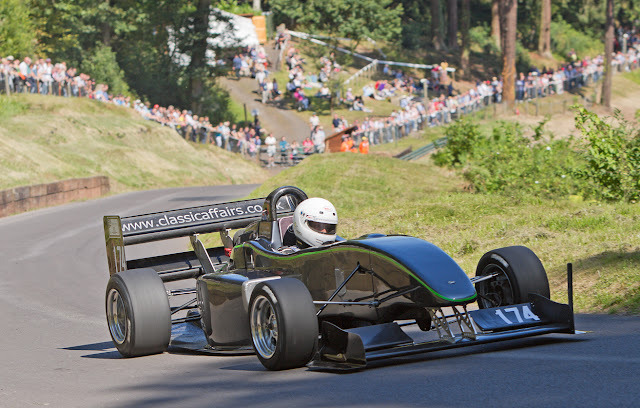 As the start of the hill climbing season approaches, Shelsley Walsh Speed Hill Climb announce key dates and headline events for the forthcoming year. The Midland Automobile Club who manage and organise the events at Shelsley Walsh are pleased to give a brief overview of what is planned for 2012. May 5th and 6th sees the Midland Hill Climb Championship visit the historic venue with celebrations for the 50th anniversary of The British Women Racing Drivers Club. The leading ladies of motorsport will be celebrated in style with a dedicated class for BWRDC members. In June on the 2nd and 3rd The British Hill Climb Championship will be in action and the MAC will be organising a gathering of significant BRMs to celebrate the 50th anniversary of Graham Hill winning his first world championship. Two of the iconic front engine P25s have already been confirmed including the “258” that Jo Bonnier raced to BRM’s first world championship grand prix victory at Zandvoort in 1959. A number of key BRM personnel have also confirmed their attendance with Tony Southgate (designer), Tim Parnell (Team Manager) and David Owen OBE. More announcements are due shortly. June 30th is the annual Reg Philips Trophy meeting with a number of invited groups competing with the REIS HSA Championship and Midland Speed Championship. The following day on July 1st the Vintage Sports Car Club have their annual gathering which always proves a very popular meeting with vintage and post vintage thoroughbred cars competing on the hill. The MAC’s key event of the year is Classic Nostalgia on the 28th and 29th July celebrating the 50th of the MGB with a selection of key cars tackling the hill. The 289 Register will also be celebrating 50 years of the Cobra with a number of historic AC Cobras on display as well as competing. Sunbeam will also be honoured, it is 100 years since they achieved a 1,2,3 in the Coup De L’auto race in Dieppe in 1912. There will also be a Street Concours d’Elegance supported by Classic and Sports Car magazine for cars which are driven to the event. Leading judge will be Simon Taylor, motorsport journalist and competitor. Visitors and competitors are encouraged to dress up in 50s and 60s style to recreate the glory days of hill climbing and motorsport. In August on the 18th and 19th 50 years of the Lotus Elan will be celebrated with a number of Lotus car clubs attending for what will be a very full on weekend. There will also be a demonstration and parade of historic and notable F1 Lotus cars going up the hill. The season rounds of in September on the 22nd and 23rd with the Midland Speed Championship and REIS HSA Championship with Ferrari, Healey, Morgan and TVR championships included.